Puma sin ProAdapt sko i Limited Edition. Denne er laget i et veldig begrenset antall og designet er inspirert av Arnold Palmer sin egen logo. Ricki Fowler har vært med å designe skoen for optimal komfort og stabilitet. Premium skinn gjør dette til en utrolig pen sko som sitter godt på foten. PRO TRACTION. PRO COMFORT. PROADAPT. IGNITE PROADAPT employs Tour-proven technologies for extreme comfort and stability in a superior, sophisticated package, designed with the world's best golfers in mind. 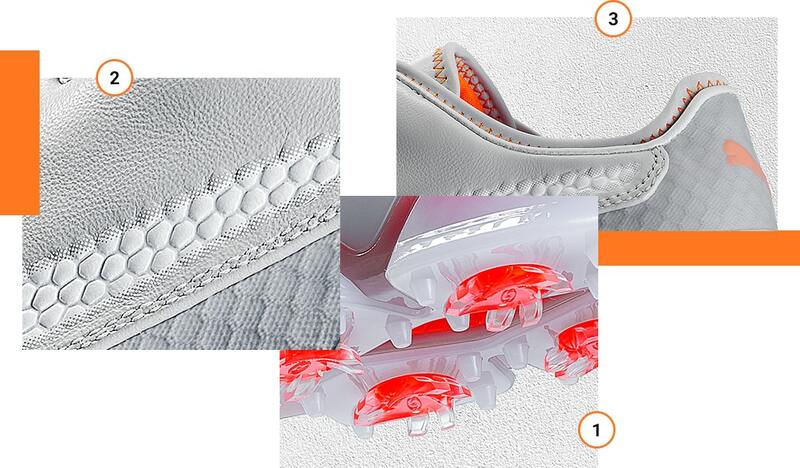 PROADAPT, designed in collaboration with Rickie Fowler, features an upper with ample support and premium, leather styling. Better players will benefit from the comfort, maximum stability and ground traction through their swing. Tour-proven, full -length TPU outsole provides superior traction and support while flex grooves improve natural movement, providing unrivaled comfort. Ultra-premium, full-grain leather upper delivers soft feel, enhanced quality and sophisticated look sure to turn heads. Dual-layer, decoupled collar construction and a molded collar provide the comfort of a running shoe, but the look of a high-end leather shoe.